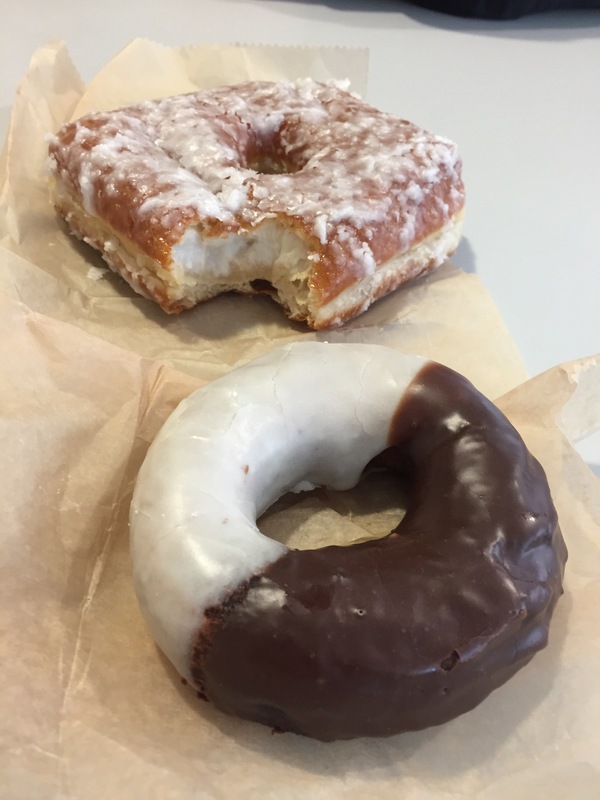 Yes, darlings…I did break my carnal rule of not going to the Doughnut Plant two days in a row. First off, I was on the Lower East Side, and it was part of a food tour. Second, today is my co-worker John’s first day here. Welcome John! We’ve missed working with you in the same building for 6 long months! So, I’m thrilled he’s finally here. And, he makes a wonderful lunch buddy. Today, thanks to our co-worker Crystal, we headed straight to Stolles. Ah, Stolles…where the Eastern European pies are filled to the brim with good, good things. John chose the rabbit (non-gamey meat mixed with sour cream and dill, with mushrooms and onion), and I had the salmon, Crystal’s favorite, mainly because it’s just salmon with some dill, in the 18th French tradition (or so the sign says), but without onion. Yes, I was the bad one who insisted on doughnuts. It’s John’s first day! And I have never tried the black-and-white cake doughnut yet (research). He ate the coconut cream yeast doughnut, shaped like a square with a hole in the middle. Both were fantastic. It’s a new week, and I’m feeling good. Hope John likes it here, eventually.